Many years ago when I transitioned to dairy free living, I sadly gave up my coffee creamer. Having served in the U.S. Marine Corps it should have been an easy transition back to black coffee (lol!) but it wasn’t. Over time, I got used to a new way of dairy free healthy living. If the coffee place was cool and it wasn’t too busy I’d be brave to order a cubano espresso (where the barista adds a 1/2 packet of raw sugar on top of the ground coffee in the portofilter). Super yummy! But most times, if the place was jammed I’d order just a plain americano with no room. Black coffee became my norm – but I still missed my creamer from time to time. A bit light in consistency but it steams up nicely for a long lasting pillowy texture provided you have a great steam wand and a patient barista (not gonna happen at that S place ;). Some brands of almond milk can have a bitter after taste you just have to find one that works for your taste. Almond milk is becoming a staple at most coffee houses usually with an upcharge. A HUGE pet peeve of mine is barista’s complaining to you that they can’t make good microfoam after I get excited they even offer almond milk and then decide to order an almond milk cappuccino. Hey barista’s! It IS POSSIBLE you just have to take your time. Don’t they get it ? Us dairy free folks want what we want. A great place here in town that makes amazingly dreamy ALMOND MILK CAPPUCCINOs is Mon Amie Cafe located at 1906 Main Street, Vancouver, WA. I look forward to savoring a perfectly crafted cappuccino anytime I’m near Downtown. Worth the trip. Tell them Sated Sensitive sent you! Soy Milk – Comparable to dairy in every way especially the microfoam department. Pretty tasty. If you’re soy free – nevermind. It is commonplace to see this in most coffee places but quickly being replaced by almond milk. Hemp Milk has a nutty light consistency. It steams up nicely but loses it’s texture super fast. I don’t really see this at most coffee houses. Coconut milk has a super water consistency very hard to make long lasting dreamy microfoam. Hard to make microfoam. It’s nice to have a splurge coffee out in town but who can afford it these days?! $3.00+ for a latte. I save that for a special occasions. As far as what I use at home… again I mostly drink black good quality micro roasted coffee. Then I saw this product! 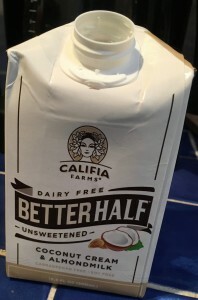 I was walking through New Seasons Market Fishers Landing just this past weekend and this beauty Califia Farms DAIRY FREE BETTER HALF UNSWEETENED COCONUT CREAM & ALMOND MILK caught my eye in the dairy aisle. It is the first creamer in along time that spoke to me – into the cart it went to give it a try! I just love New Season’s for all the wonderful food sensitive products they offer! Ingredients: Almond milk, coconut cream, natural flavors, calcium carbonate, sunflower lecithin, sea salt, potassium citrate, locust bean gum, gellan gum. Nutrition Facts: Only 15 calories per 2 TBS. Total fat 1.5 g. Sodium 30 mg. Sugars 0. The nutrition facts speak for the product. 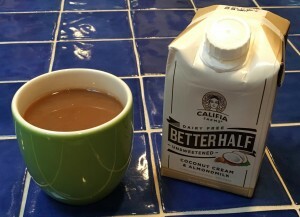 A very good non-sweetened non dairy creamer alternative. 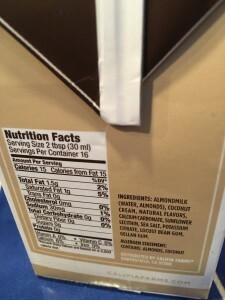 In addition, this product is labeled as a non GMO, carrageenan free, vegan, gluten free and kosher product. 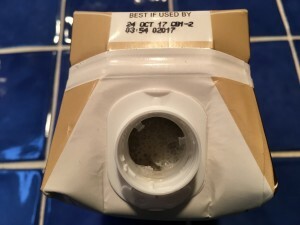 I purchased this product on February 1st – and the BEST if used by date is 24 October 17 – that’s over 8 months of shelf life. YIKES! I’d nutritionally rate this product a B+. As a nutritionist I am unable to rate this product with an A rating because of the inclusion of NATURAL FLAVORS listed on the ingredient label and the extended shelf life. 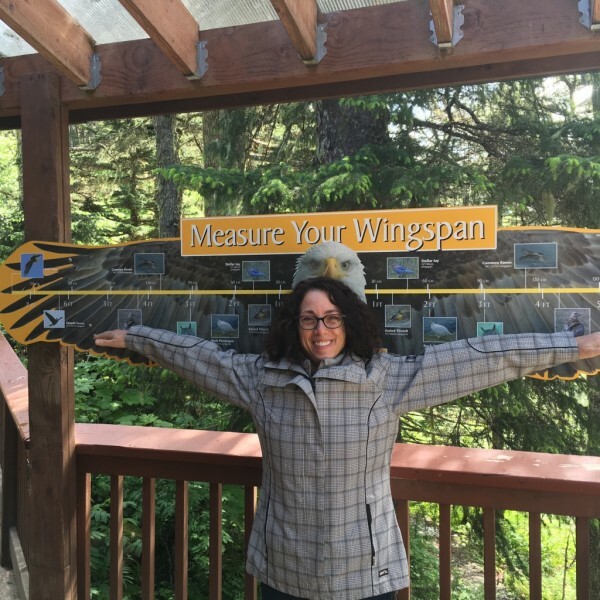 I am a strong proponent of any Federal and State mandates that require food manufacturers and food purveyors regardless of size to list ALL ingredients contained in any food product for safety of food allergy and food sensitive people. Sated Sensitive Denise Hays Review: Nice taste. Nice texture. No bitter aftertaste. Yes ~ it does smell like coconut. It was on special at New Season’s – priced (I recall) at either $3.99 or $4.99 for the pint carton. That’s 16 servings at $4.99 which equates to $0.31 cents per cup of coffee. On their website the 16.9 fl oz product is listed at $8.99. Wowza! I would definitely purchase again as a nice treat for my black coffee every once in a while. If you give this product a try let me know what your thoughts are!